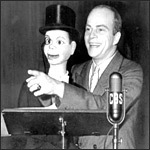 For almost two decades, Edgar Bergen was remarkably successful in bringing the most unlikely of vaudeville acts to radio: ventriloquism. The star of the show was Bergen’s dummy, Charlie McCarthy, a precocious child with a quick wit who was perpetually dressed in a top hat and tails. The human co-stars included Don Ameche, Dorothy Lamour...and W. C. Fields, whose verbal battles with Charlie McCarthy were nothing short of legendary. A wide variety of guests appeared on the program, including Rita Hayworth, Boris Karloff, Roy Rogers, Carmen Miranda, Donald Duck, and Bergen’s young daughter, "Candy". Over time, Charlie would have to share Bergen’s lap with wooden pals Mortimer Snerd and Effie Klinker. Description: "I'll clip ya, Bergen…so help me, I'll mow you down!" (9/12/1937) W/ BETTE DAVIS "WOOLENS"
(12/26/1954) William Hopalong Cassidy" Boyd"